After finishing Uni, I wasn’t sure what I wanted to do, there were so many choices but none of them were for me. I knew that I wanted to travel and I looked at ways to combine that travel and to earn a living at the same time. Twelve months on I have done it, I started with the Greece Water sports experience then Divemaster and now I have just landed a job as a Stewardess on a Superyacht. I am the happiest girl in the world! I was searching online for inspiration and came across the Greece Waters sports experience, run by Flying Fish. Aimed at the adventurer, the three week holiday introduces Dinghy Sailing, Windsurfing, and Diving! A bit like a taster but you get a qualification in each discipline, have a lot of fun and meet some great people. All the training takes place in Vassiliki, Greece. Diving was first, growing up in Mauritius meant I had done a bit of diving before, which gave me a head start. It was awesome, the water was lovely and warm and the Instructors were great. Almost all your time is spent in or under the water which I really liked and suited my style of learning. After a week I had gained my PADI Open Water. Dinghy sailing was not my natural calling in life, I found it difficult to get started. The instructor was very patient and made time for me one on one. By the end of the week I did get the hang of follow the leader and tacking. I was able to go upwind and downwind which at the beginning of the week I didn’t think I would be able to achieve. I was awarded my RYA Level 1 Sailing. I had good fun learning with the guys that were on the Dinghy Instructors Course. Windsurfing was an interesting experience which I found difficult to start with. Once I got up and going I did really enjoy it. My instructor Jake was very, very patient and helped me to learn at my own pace. At least the water was warm as I fell off a lot! Full credit to the guys on the Windsurfing Instructor Course. I did a lot of swimming and laughing. The last two days were my favourite and I would like to do more Windsurfing in the future. After the three week Waters sports experience I came to the conclusion that a life in the outdoors was for me. Of all the watersports, diving was definitely my main passion and I just wanted to do more. I decided to sign up for the PADI Divemaster course as it turned out it was the best decision I ever made. Already armed with my Open Water I went straight into Advanced Open Water, EFR and Rescue diver training. I did a lot of these courses with my new dive buddy, Sophie, who was also doing her PADI Divemaster at the time. The first week was the STCW basic training course, required by everyone who wants to work onboard a Superyacht. 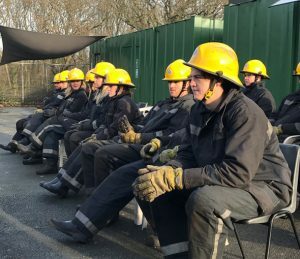 The STCW course is mostly practical but it really makes you think about the safety requirements needed to be yacht crew. The course was very professional but Mark, our instructor for the week made the course fun and enjoyable. Part of the course is classroom based, which I normally hate but Mark made me laugh all the way through. The components we did were fire fighting, security awareness, sea survival, first aid, and personal safety and social responsibilities. The second week was all about Stewardess training. We were taught by a Chief Stewardess with a lot of experience in the industry called Simona. I’m so glad I did this as I learnt a lot of things which have helped in my new job. The main elements were housekeeping, silver service, flower arranging, food hygiene, wine tasting/theory, cocktail making and barista training. The way the course was delivered made it fun and informative and Simona brought in a lot of her own personal experiences. I also did my Powerboat level 2, PWC proficiency, VHF Radio and a day spent working on my CV. Powerboat and PWC (jet ski) were 3 of my favourite days and a great way to end the course. Part off the Superyacht Stewardess course is the Superyacht Recruitment Event in Antibes. I went with my friend who I met during the course with Flying Fish in Cowes. We became great friends during the training so we booked accommodation together in France. When I was in Antibes I got my first interview after a week and from that I got to the second stage and met the Captain. The day after the interview I did some day work on the boat, a 38m Motor Yacht, and from that, I got the job!!! I now have been working on the same boat for the last 4 months and I am looking forward to the summer season travelling around the Med. The money has allowed me to do some cool travelling so far and I am also saving to spend the winter travelling and diving in Oman and Australia. Life is good!